Don Schliff, renowned Port collector and one of the founders of Wine Warehouse, the famous wholesalers headquartered in Los Angeles, organized another historic Port tasting in February 2019, featuring 100 years of Taylor Fladgate Vintage Port. The wines for this spectacular tasting came directly from Don Schliff’s underground refrigerated cellar. Most of the wines were acquired from England over the last 40+ years and the bottles have lain undisturbed since then. The provenance was perfect! The Ports prior to 1963 are English bottled except for the 1908 and 1945. The remaining wines were Oporto bottled.. All fill levels were base of neck or better. Most of the Ports were opened by Don with Port tongs just before the tasting. The high alcohol, elevated sugar levels, convex neck and gradual deterioration of corks in vintage Port make their removal challenging when using a traditional cork screw. Long ago aficionados dispensed with cork removal and decided to open the bottle by breaking its neck below the level of the cork. However, unlike the showy French who snap off the tops of large Champagne bottles with sabers, the Portuguese came up with idea of applying circumferential, red hot iron to the bottle neck to heat it to several hundred degrees and then quickly applying a cloth soaked in ice water. The abrupt temperature change produces an encircling fissure in the glass that allows the neck to be easily snapped off. The event was held on February 3, 2018, at the Hotel Bel-Air in Los Angeles where 22 Port enthusiasts flew in from all over the world for the tasting. Special guests were Adrian Bridge, Managing Director Taylor Fladgate, Darrell Corti, famed Port and Sherry expert, and Roy Hersh. Throughout the tasting these gentlemen offered insightful observations on the stylistic differences of the individual wines and Vintage Port in general. Other distinguished people in attendance included Bipin Desai, Manny and Willette Klausner, Robert Michero, Robert Willett, Kathleen Martinez, Jose Luis Nazar, Cary Feibleman, Robert Langer and Blake Brown. Throughout the tasting Adrian Bridge offered observations on the wines and their respective vintages as well as interesting comments on what was happening in the world at the time of the vintages. Darrell Corti commented on vintage Port throughout the 20th century as well as offered keen observations about individual wines. Roy Hersh, founder of the widely read, www.fortheloveofport.com, also offered his insightful comments on the stylistic differences of the individual wines, their respective vintages and on vintage Port in general. This extraordinary tasting was accompanied by an outstanding luncheon prepared by the Hotel Bel-Air’s restaurant Wolfgang Puck at Hotel Bel-Air. Famed chef Wolfgang Puck’s renowned cuisine perfectly complemented the Ports. This event was a sequel to many Vintage Port tastings that Don has done in the past. 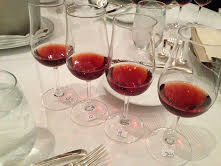 The first was a tasting of 1945 vintage Vintage Ports that Don organized in 1993 at the original Spago in Hollywood. 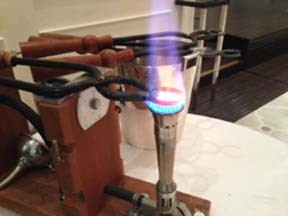 It included a tasting of twelve 1945 Ports with Clive Coates and featured a menu crafted by Wolfgang Puck. In 2007 Don presented a retrospective tasting of the 1955 vintage, with 15 shippers at the new Spago in Beverly Hills where Ardison Phillipps was the guest of honor (sadly, Ardison passed away in 2011). In February 2015, Don presented a tasting of eight top 1963s along with Quinta do Noval Nacional 1958, 1960, 1962, 1963 and the famous bottling of Quinta do Noval 1931 at the Hotel Bel-Air, food pairings created by Wolfgang Puck. (to read about this fabulous event, including tasting notes, Vintage Port in general, Wolfgang Puck and more, please click here). In February 2017, Don presented another unforgettable Vintage Port tasting featuring The Great 7’s: 1997, 1977, 1947, 1927 and 1867. Don presented a Vintage Port tasting in February 2018, featuring four top 1935s and twelve 1945s. (to read about this fabulous event, including tasting notes, please click here). In November 2018, Don presented a tasting featuring five different bottlings of the 1931 Quinta do Noval and 1945 to 2016. The current tasting is surveying 20 vintages of Taylor Fladgate from 1890 to 2016. The first flight of this most recent event consisted of four Vintage Ports from 1890, 1908, 1912 and 1920. The second flight comprised four Vintage Ports from 1924, 1927, 1935 and 1942. The third flight consisted of three Taylor Vintage Ports from 1945, 1948 and 1955 as well as a 1960 Fonseca Vintage Port. The fourth flight included four Taylor Vintage Ports from 1963, 1966, 1970 and 1977. The fifth flight consisted of four Vintage Ports from 1983, 1992, 1994 and 2016. There was also a mystery Port, the 1934 Taylor Colheita which was bottled in 1977. Conceiving and executing a multi-course meal for a Port tasting is almost as difficult as doing one for Sauternes. Both share the quality of extreme sweetness, but one is made from botrytised raisined white grapes, while the other is a sweet red wine whose alcohol level is supplemented with brandy to the 18-20% range. So Port, in addition to sweetness, has the heat of alcohol for the cook to contend with. The classical accompaniment for Port is Stilton cheese and freshly cracked walnuts. Some cultures like spiced savories with the wine. Our editor, John Tilson, likes popcorn. The common feature of all three groupings is salt and umami. Bottle was flawed, having a musty, medicinal nose, not recommended for tasting by Adrian and therefore not served. Pale ruby color, with a faint nose of almonds and spice. Very attractive, tasty flavors of berries, raisin, spice and herbs build on the palate then taper off, ending in a soft, warm finish. It is balanced, round and medium bodied — Very Good. Light ruby color, with an aroma of dusty cherries and a faint angular note. Flavors of baked red cherry and vanilla have a cough drop character. The finish is bittersweet — Good. Good color of pinkish ruby red, with nice, inviting nutty/dusty aroma. Cherry dominates the taste, with added notes of dark chocolate, raisins and spice, resembling an old Tawny Port. It has a good backbone, ending in a very long, nutty-tinged finish — Very Good Plus. Nice, clean ruby red in color with a faint rim. Bouquet of plum, red berry and dried cherry is very pleasing, seguing to a similar palate, with added notes of dark chocolate. It is medium bodied, with good acidity and a faint alcoholic note on the finish — Very Good. Ruby red in color, it has a nose of sweet cherry, berries and plums. The flavor mirrors the nose, with accents of caramel, spice and raisins. The finish is soft and a bit alcoholic — Good Plus. Ruby red in color, the nose is very clean with a light plum and cherry character. Initial taste is explosive with dark cherry, berry, smoke and plum that falls away, ending in a nice, soft, long finish. It had good depth and acidity — Very Good. Color of pinkish ruby, it has a good, open nose of dried fruit, sweet black cherry and spice. The flavor is delicious from beginning to end, redolent of sweet black cherry and spice. It is concentrated, rich, round and smooth — Very Good Plus. Light ruby color, with a beautiful bouquet of lilac, subtle spice, dried cherry fruit and a maple note. Flavor is delicious, similar to the nose, highlighted by black licorice, edged with caramel. It is rich and balanced, with a medium long finish — Outstanding. Rich, ruby red color, with a light rim, it has a faint, elusive nose of light, dried fruit. On the palate, dark red berries are edged with faint notes of chocolate, plum and black currant that carry through to the lingering finish — Very Good Plus. Rich, ruby red color, with a light rim, it has a sweet aroma of cinnamon, flowers and berries. Flavors of light vanilla, luscious cherry, spice and smoke are long and a bit hot on the end. It is medium bodied with good depth — Very Good Plus. Light ruby color, it has faint nose of delicate, dried fruit, with an alcoholic note. The flavor is clean, with subtle and delicate berries, vanilla and sweet, dried cranberry. It is a soft, pretty wine, with a lingering finish of sweet fruit — Very Good. Bright red color, with an excellent, clean, light cherry/berry nose. Flavors mirror the nose, with added notes of marzipan, vanilla and spice. The finish is long and a bit hot on the end — Very Good Plus. Slightly darker ruby red color, with a light rim. Substantial aromatics offer berry and light vanilla that segue to berries, cherries, chocolate, maple, mint and a light nuttiness on the palate. It has a complex taste, with a powerful structure, good balance and depth — Outstanding. Bright red in color, it has a clean, pretty nose of pepper, nutmeg and red fruit, with a faint alcoholic tone. In the mouth, it is sweet and juicy, rich, red cherry, spice and pepper. Full-bodied, the finish is long and strawberry-tinged — Very Good Plus. Bright red in color, aromas of pomegranate, spice and dark fruit are inviting. Flavors are big and luscious, with ripe berry, cinnamon, nuts and sweet black cherry, but the wine is still in balance. It is a bit alcoholic, rich, round and long — Outstanding. Medium ruby color, with a light rim, it has a floral, spice and plum nose that carries through to the sweet, supple palate, accented with vanilla and light cherry. It has a lingering aftertaste — Very Good Plus. The color is deep ruby with purple highlights. The rich aromas are open, loaded with dark fruit. The palate shows deep, delicious berry extending through the long finish. Added notes of spice, sweet black cherry and chocolate enhance — Outstanding. Medium ruby color, it has a subtle plummy nose, with faint mint and spice. The flavor is sweet and expansive offering blackberry, mint, spice and light herbs. It has a medium-long finish — Very Good. Medium ruby color, the bouquet of dark fruit, plum and rhubarb is lovely. Flavors are similar, with highlights of pomegranate, raisin, black raspberry, cedar and spice. It is big, rich, sweet, round and long — Outstanding. Don Schliff’s Vintage Port tasting was an exceptional event, proof once again that Vintage Port is one of the greatest wines produced in the world. Nice writeup Christine. It was a very special event held on Super Bowl Sunday and we had our own super bowl of fun in the glass. Always excited to read about well thought out tastings. I also held a horizontal 1955 tasting in Chicago where I first met Roy Hersh and a fellow ‘55er Richard Jennings.